Biocube 32 LED Turbo Upgrade! Biocube 32 Gallon LED Complete Plug and Play Upgrade! Only 4 plugs! Are you dissapointed that you can't grow most SPS, anemones or clams with your stock Biocube 32 LED aquarium? This is YOUR solution! Grow everything from every ocean with this upgrade! The brightest known light system ever engineered for this aquarium. You won't find a brighter and more reliable system available at any price! This system is 5X brighter than the stock LED version! This system has been tested and approved for use with all known versions of this aquarium. We now have several freshwater planted aquarium LED options available, just email us! Very easy to install, nearly anyone can do it by following our step by step guide with videos! The Iridescence Booster Upgrade enhances the "black light" glowing effect, without making the aquarium purple. Click here for the installation guide. Current lead time - In stock and ships within 4 business days! This took me about 10 minutes to install, hood looks stock from the outside. Infinitely brighter than the original lights and I love the realistic fade up sunrises in the morning. About an hour after installing, my corals opened up huge! My ricordia that was 1" before opened up to about 2.5", really beautiful black light effect as well with these lights, but doesn't washout any colors. They look way better and brighter than my local fish store's LEDs too. Installing these doesn't require you to ruin your hood either, I could probably revert back to stock lighting in about 5 minutes, not that I EVER would. I am thoroughly impressed. I just installed my Biocube32 upgrade kit and wanted to immediately write to you to express how satisfied I am with my purchase. I also run a small business making electronics for smaller/hobby markets and I understand the complexities of making specialist kits like these. I feel like I got incredible value for the price I paid for this kit. Thank you. Keep doing what you're doing! Awesome LED system. Lots of good reviews online so I decided to try it. Looks great. Install took me under 20 minutes and I took my time. I love how the hood still looks 100% factory after the install, but the lights are now several times brighter. Some reviews online said it was too blue, but thats absurd because you can adjust the color using the controller to however blue or white you want it. I personally find that the corals seem to grow much faster under the blue light. Maybe that's why oceans are blue? Been running for a couple of weeks and my corals are responding very well. I started out at the recommended 30% and I think I'm at 40% now. I love the color spectrum and the controller is very easy to use. I went out and got me an acro to test the claims that these light will support any coral and so far so good, good color and polyp extension about a week in. Installed the lights a week or so ago. Beyond impressed. Already noticeable growth. Colors are beyond expectations. Installation is straight forward and very detailed GIF files to assist. Worth the price. Customer service has been great so far. Get the lights. Worth every penny. Full Assembled - NO SOLDERING REQUIRED! Just plug it together using 3 plugs. Keeps the aquarium hood looking unaltered and stock from the outside. Includes other accessories required to install your LED system into your own hood, all you need are a screwdriver and handheld drill for 1 single easy hole. 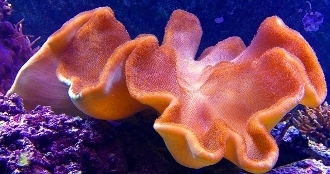 It is capable of supporting every fish, coral, and anemone (including Softies, LPS, SPS, and clams) from every ocean. Grows corals faster than the natural ocean. This is the brightest, most advanced, and simple to install LED system for the Biocube 32 available anywhere (4X brighter than the new stock Biocube 32 LED aquarium!). INCLUDES the easy to program digital HurricaneX controller ($90 value!) for automatic dusk/dawn and storms, OR upgrade to the wireless Bluefish Mini controller, and control your lights from your PC, phone or tablet. Proven Luxeon ES premium LEDs in the 14,000K Super Full Spectrum - This can be adjusted from 4,000K - 24,000K with the twist of a knob! 50,000 hour lifespan and 3 year limited warranty on the drivers and power supply! 100% designed, manufactured and assembled in Louisiana, USA! Outputs more than enough PAR to blast and potentially kill most corals, so a detailed acclimation guide is included to ensure your success. 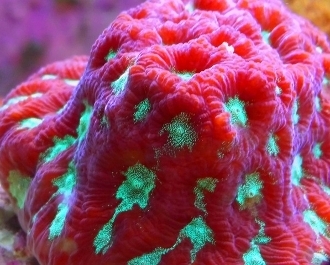 Steve's LEDs guarantees* that this particular light system will be able to grow all of the 5,000+ species of photosynthetic corals, clams and anemones within the aquarium trade so long as your water quality parameters are ideal for marine aquariums. The item you receive may not look identical to the picture due to continuous improvements to our products. If you order the Iridescence Booster upgrade, the Step #3 in the manual is required (very easy), and will add about 5 extra minutes to the install time. This is because the Hyper Violet LEDs get a bit hotter than the other LEDs, and require more airflow. Without the extra airflow, it may make dark spots on the splash guard. This comes with our premium 14,000K Super Full Spectrum combination, which has proven itself in over 9,000 aquariums around the world! This is fully adjustable using the included digital controller from 4,000K (yellow/white) to 24,000K (purple/blue) and infinitely everywhere in between. With all channels on 100% power, it yields a 14,000K blue, simulating an ocean depth of about 15 feet -20 feet : where most aquarium corals naturally grow. If you want a custom combination for your own choosing, we can make it for you (we just cant guarantee that it will grow corals 4X faster than the natural ocean like our 14,000K Super Full Spectrum does!). For a premium upgrade at minimal expense, choose the Iridescence Booster upgrade! This upgrade swaps out 4 of the Royal Blue LEDs with 4 Hyper Violet LEDs. It doesn't change the brightness, it only improves the color and makes iridescence explode and pop out of corals and anemones. The Iridescence Booster upgrade improves the "black light effect" that corals naturally have, as well as improves coral growth rates. 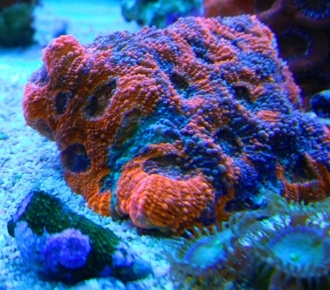 If you love the black light effect that most corals put off, then you'll definitely benefit from this upgrade. If you have mostly fish in your aquarium, then perhaps the Iridescence Booster option won't be beneficial. What's the difference between the HurricaneX and Bluefish Mini controllers? Both of these are controllers, that have similar features. They both allow for silky smooth sunrises and sunsets, and allow you to do pretty much whatever you want with your lights, by independently controlling color and intensity, while timing them to suit your schedule. HurricaneX is easier to use and program , has proven to be very reliable, and is an ideal standalone controller. HurricaneX also has the ability to have an optional temperature probe. You can use this temperature probe to measure the temperature of your aquarium water, hood temperature, LED temperature, or anywhere else within the cords six-foot long reach. HurricaneX is programmed using the easy-to-use interface on the controller itself. Bluefish Mini requires a solid 2.4Ghz Wi-Fi connection, and is programmed through an app on your phone, tablet, or PC. Bluefish Mini isn't compatible with 5.0Ghz connections, nor temperature sensors.